The roar was terrifying. The walls and ceiling of our tiny hostel seemed to bend and buckle under the force of it. I have rarely been truly “scared” in all of our time on the road, but my mind was racing as I laid on my back listening to the deafening destruction of the storm outside. This – I thought to myself – is Patagonia. What have we gotten ourselves into? Here we were, at the end of the Earth, at the mercy of some of the planet’s most unpredictable weather and we were about to spend the next 8 days in the mountains with nothing more than a barely passable used tent, a sleeping bag that wasn’t rated warm enough for the climate outside, and some budget gear that we picked up during our time in Punta Arenas. 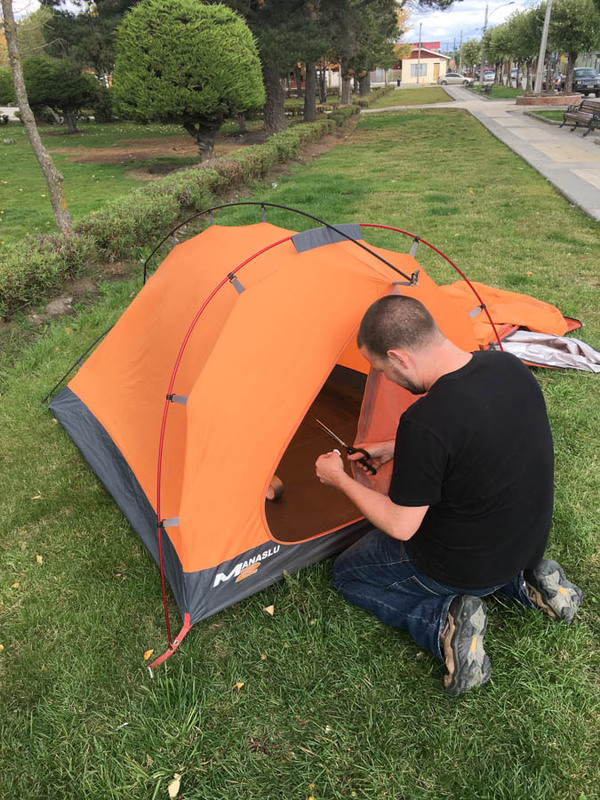 Setting Up Our Third Rental Tent in Front of Erratic Rock To Test it. Every One Had Holes! I was convinced that we were going to have to cancel. 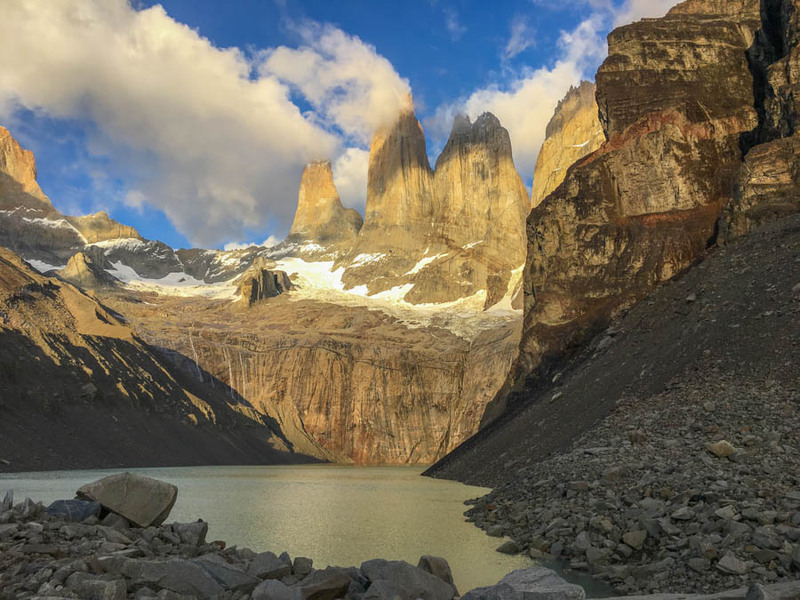 Torres Del Paine in Chile has always been famous for having capricious weather, with wind gusts so strong that they frequently pick up trekkers and slam them on the ground… literally. But the week that we chose to arrive was one for the books. The entire backside of the O Trek that we had planned to take was closed, just days before our arrival, due to heavy winds and flooding. Trekkers were stuck on the trails and it was absolute mayhem in the park. The words of Ruth, the speaker at the hiker safety meeting we had attended the night before, were still ringing in my head. Deaths. With an “s”? Plural? I didn’t sleep a wink that night. I rolled over with the alarm at 5:30 am, still intimidated by the sound of the thundering wind, I literally said a small prayer before waking Dariece up. I’m not at all a religious person, so this was a first for me. 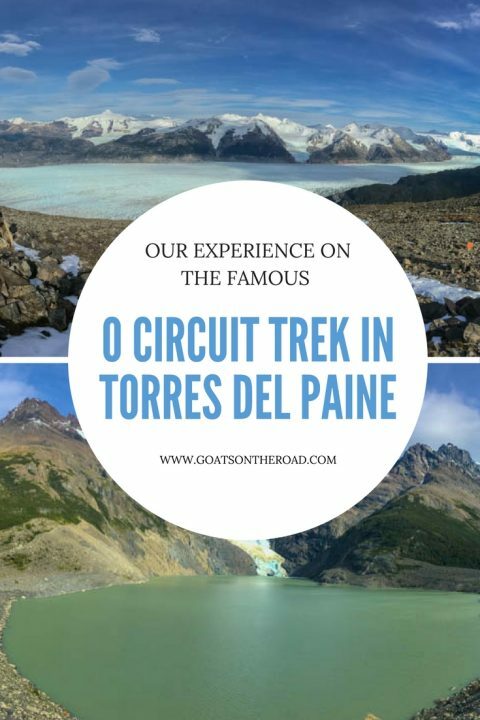 Don’t miss our 4-part video series below from trekking & camping in Torres del Paine! We had already packed our bags the night before, so it was a simple roll out of bed, brush teeth and head out situation. When we opened the door to the hostel and peered outside, it was still windy and rainy and the cold was biting, but the extreme gusts of wind had definitely died down. Now it was just like a really bad storm that we grew up seeing in Canada, rather than a hurricane force blizzard, which is common here at the end of the world. We met up with our friends Jarryd and Alesha from Nomadasaurus and boarded the 2 hour bus ride out to the park. As the bus cruised down the highway, full of nervous and excited trekkers, there was a feeling that everyone in that bus had no idea what they were getting themselves into. Looking back now, I can say with certainty that was definitely the case. After about 1 hour on the bus, to our surprise, the thick, dark, apocalyptic clouds began to part. At first there were brief moments of brightness that bleached the shadowy mass, and then beams of sunlight pierced through the clouds, giving us hope that we could survive this experience. 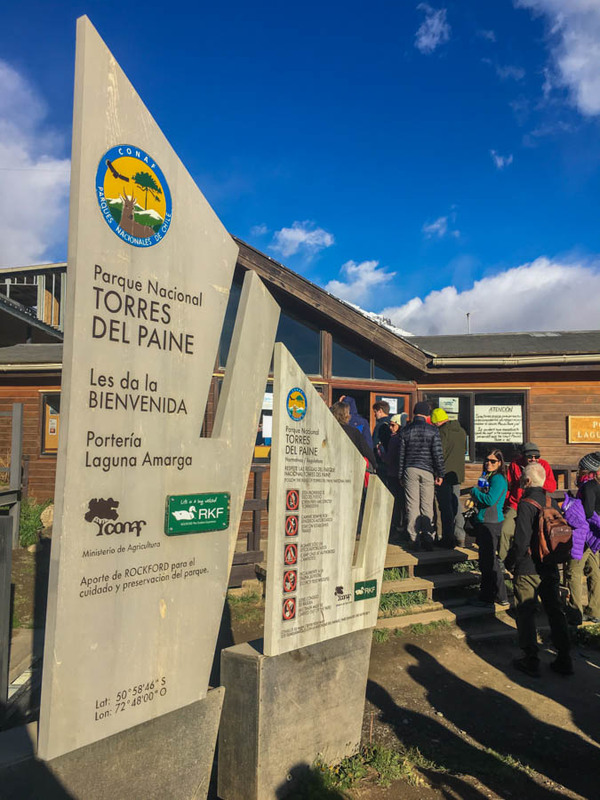 By the time we reached the entrance to Torres del Paine National Park, somehow, the entire sky was blue. We got off the bus with massive smiles on our faces. In an instant, I could feel confidence growing inside of me. The trek we were embarking on, like all things epic, has multiple names. 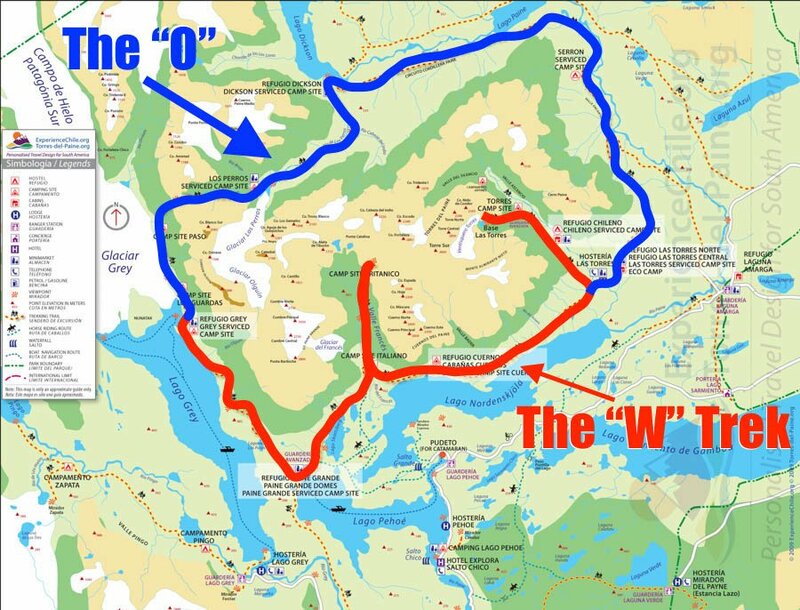 “The O” is the most common, but it’s also known as “The Circuit Trek” and “The Backside”. 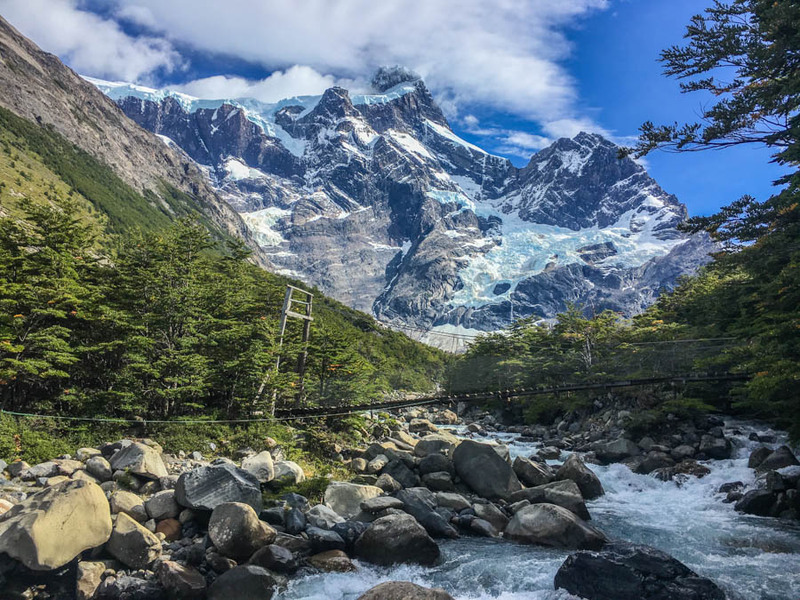 It stretches for 132 kilometers through the depth of Chilean Patagonia with little more than a few small “camps” or rest areas along the way. The backside is out there. 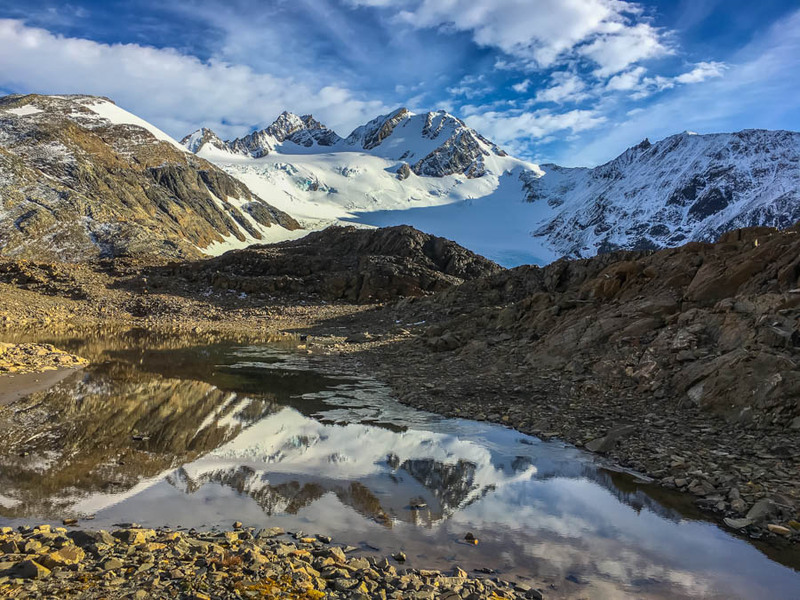 There’s nothing around for miles, just trekkers, wildlife, forests, snowy peaks and the dramatic landscapes that have made this national park so famous. Even though I was terrified the night before the trek, I am so happy that we ended up doing the more difficult O Trek. The W is much more commercialized with many tours and all the amenities you’d expect to find in town. People on the W were trekking with blow dryers, mini skirts (seriously!) and in some cases, rolling luggage – with porters carrying this gear. The backside is a whole new monster. Because there are no restaurants at some of the camps (just simple camp sites, drop toilets and a small 3 walled shack for cooking in), most trekkers on the O carry their own food. Either that or they hire a porter ($150 / day) to carry it for them. Our Food Buggy. A Lot of Weight! This is why our bags were so ridiculously heavy. 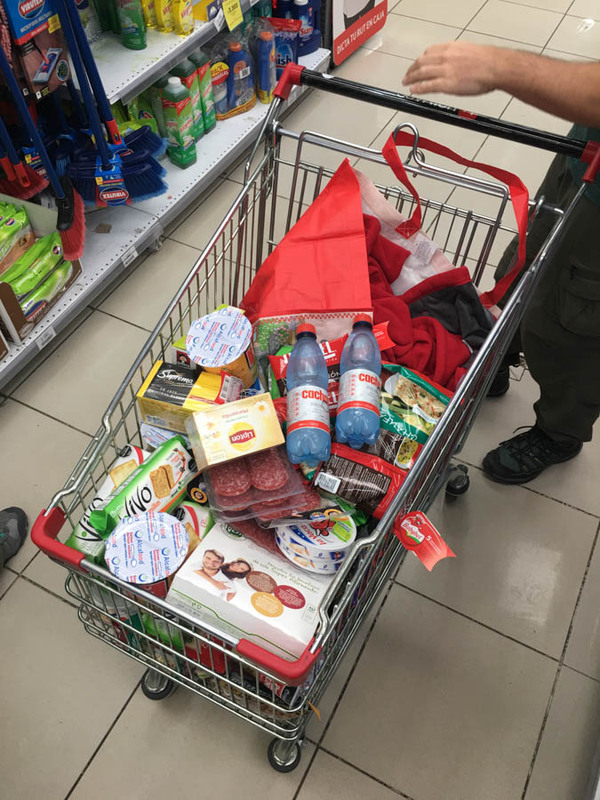 We had 8 days worth of food crammed into them, along with cooking supplies like pots, pans, plates, a stove, gas and utensils. On the first days of the trek, before we had eaten some of our load, our bags dug into our shoulders and hips and we could feel our backs ache under the pressure. 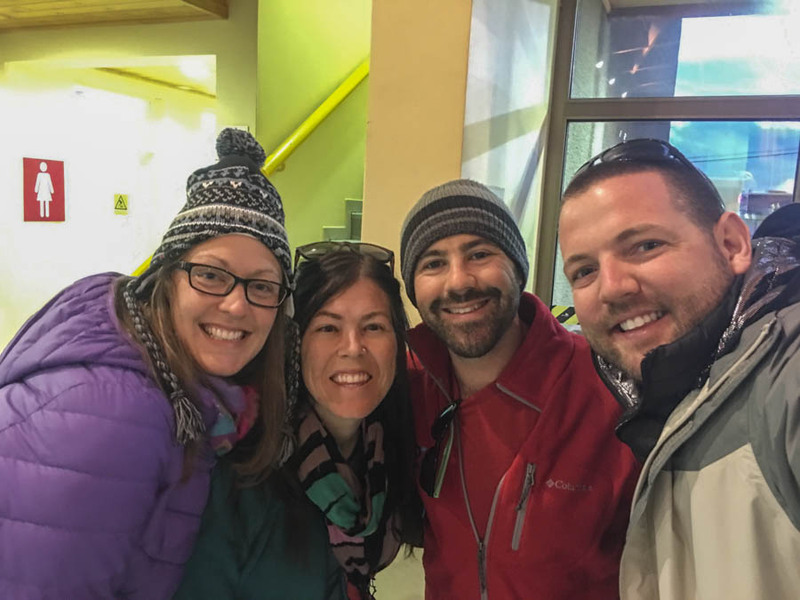 Our packs were heavy, yes, our backs were sore, yes, but there were smiles permanently stretched across our faces. All four of us were ecstatic. Here we were, at the southern edge of the planet, hiking with good company and beautiful weather… we couldn’t have been happier. That first day gave us hints as to what was in store for us. Commanding grey peaks poked into the powdery blue blanket of sky that hung over our heads. Everything seemed larger than life. The scenery was so perfect, so picturesque, and so crystal clear that it was completely surreal. It just didn’t seem that landscapes so grand and intimidating could actually exist. Day one was an “easy” one. 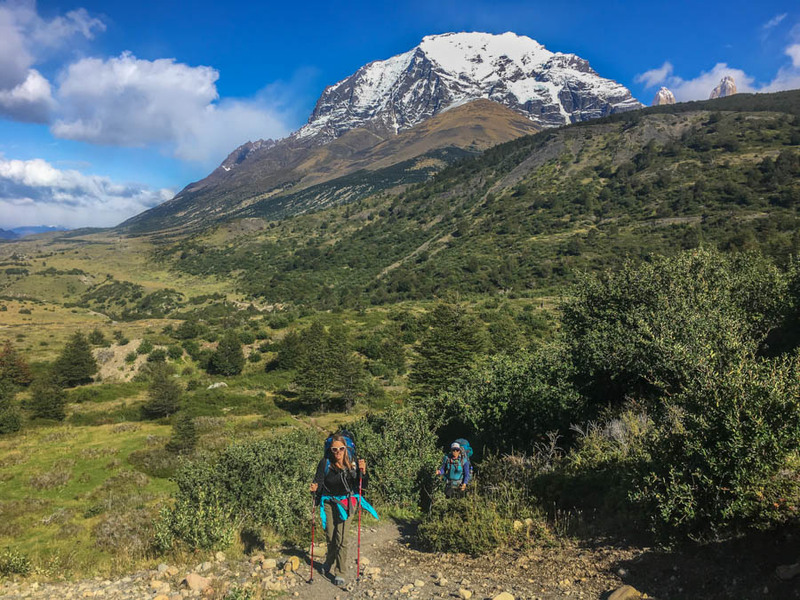 It was just 5 hours for us to go from the entrance of the park to the first camp, Serón, and although we had some extremely powerful wind after traversing a 300 meter high ridge, the sun shined all day. We set up our first camp under the protection of a few small hills and cooked our first meal together. We were all relieved that we were actually on the trail, and that the weather, at least for now, was on our side. Amazingly, the weather held up for us for the entire 8 days on the trail. We had a few hours of light showers, some pretty strong winds at times, but for the most part we had perfectly blue skies and clear weather… a real anomaly for this part of the world. After that first night, we started to realize that we were going to be on the trail with the same friendly faces. About 12 of us had booked all of the same campsites right through until the end of the trek, a common occurrence on the O. This meant that (as one British hiker in our group put it) we were like a travelling hostel. Every night we ate, drank a bit of booze, chatted, laughed and camped beside the same people. Being an adventurous bunch, every person had a unique story. We were so inspired by our fellow trekkers, as we often are by other travellers, and we learnt a lot from them. 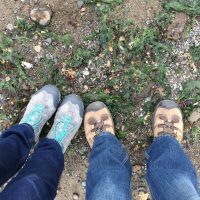 One couple had quit their jobs to travel for a year (as we did 8 years ago). Another had left Germany 2 years ago on bicycles. They rode from Germany to the UK, then shipped the bikes to New York and had ridden all the way down to the end of South America over the course of two years. Although most days on the “O” Dariece and I were trekking alone, and we loved that we could have the trails to ourselves, but meet up with our new friends at the end of each difficult day. Our first 4 days were only on the backside. We had passed by glaciers, sat on the beaches of lakes, camped under snowy peaks and hiked over a 1,200 meter high pass. By the time our trail reconnected with the W trek, we all felt like we had really accomplished something incredible. In a way, the end of the backside felt like a finish line for us. We were only half way done the entire trek because we still had 4 days on the W, but we all felt like we had been somewhere that the W people didn’t understand. As the trails connected, it was like a meeting of two worlds. Us, with our grubby gear, unshowered and exhausted, meeting up with the W trekkers, who had make-up on, flip-flops and day packs. I can just imagine what mountaineers feel like when they descend from the summit of Mount Everest to see all of the 5-day trekkers reaching base camp. Even though the rest of the trek was a totally different experience, we still loved it. The scenery was still unbelievably breathtaking and although there were more people on the trails, it didn’t matter to us. 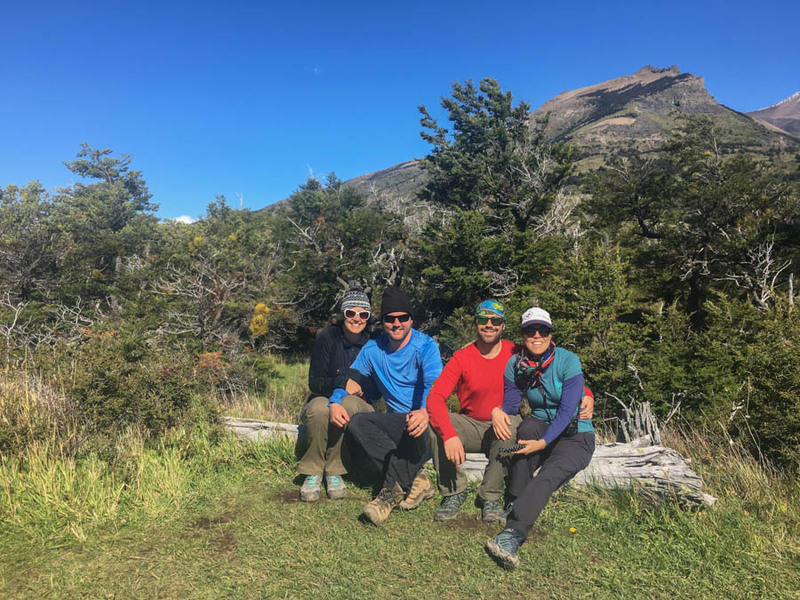 We were just happy to be trekking in Torres del Paine National Park. The finale of this amazing 8 day trek was at “The Torres”. A massive rock formation that looked like three glowing fingers rising from an emerald lake. At first, it seemed that we were going to miss the view entirely, but having had such great weather until this point, we chalked it up to “you can’t win them all”. But it turned out that our luck really did hold. After waiting around in the bitter cold, wind and rain since 6:00 in the morning, the sky finally parted. The golden peaks showed themselves and were truly a spectacle to behold. We could definitely see why so many people woke up so early to make it to this part of the trek for sunrise! On the final day, we were the second pair from our group to make it to the end point. Our friends Jazza and Alesha came shortly after us and Jazza generously bought our group of trekking friends a round of beer to drink in the park while we waited for the bus to take us back to Puerto Natales. While the O trek was difficult, I think it’s definitely doable for anyone with a decent level of fitness and a good amount of trekking experience. There was a 65-year-old man and a family with 3 kids (ages 12 and 14) in our group. For us, it’s easy to say that this trek is doable, but we had fantastic weather. If the gods had decided to bring down the entire wrath of Patagonia upon us, we’d be singing a different tune. I can’t imagine climbing the pass while being thrashed around by gale force winds, or sleeping through the night with a soaked tent and flooding outside. We’re just happy that the weather was on our side and we were able to fully enjoy this remarkable part of the world. Torres del Paine is probably the most scenic place I’ve ever seen, and I come from a naturally blessed place in Western Canada. Patagonia delivered on all of its promises and then some. We can’t wait to return to this part of the world, perhaps not to embark on the O again, but to explore some other parts of this massive million square kilometer outdoor wonderland. Beautiful Pictures! I would love to go over there. Awesome Place. Wow, the Frances Valley picture is amazing, can barely imagine how magnificient it is in reality! wow incredible adventure, beautifully written, gorgeous photos. Congratulations on accomplishing this great trekking. 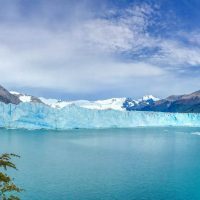 I am from South America, but have yet to visit Patagonia..certainly high on my list. 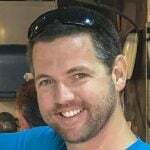 Thank your for sharing your awesome experiences. This is very beautiful! Nice photos you got here. I hope I could trek there some day!